Ekal is a story of social dreamers who believed that change is possible and education can be the medium to bring the change in the life of last man in the last row in the remotest parts of India. This story is like many water streams coming from different sources and come together to form a river. In early eighties many of these social dreamers reached at different places to act on their dream based on the belief that change would come through active participation of local communities. Late Dr.Rakesh Kumar Popli (an Indian nuclear physicist), Dr. Rajneesh Arora, Dr. Mahesh Sharma from IIT and Mr. Ashok Bhagat from BHU visited Bishanpur in Gumla district (presently in Jharkhand) in the year 1983 and conducted a situational analysis of this tribal area. Their study identified education, health along with social, gender & economic disparities as issues needed to be addressed on priority. Dr.RakeshPopli and Dr. Rajneesh Arora started working with a focus on education and eventually developed methodology of informal teaching to ensure literacy among local communities and in particular among children. This laid the foundation of experiment of single teacher schools. The other and most important aspect of this story started when in 1985, Shri Shyam Ji Gupta, a social activist who has been working with Vanvasi communities in the state of Orissa, initiated a plan in Fulbani district. He brought forward the idea of “Fulbani district upgradation project” to ensure literacy among local communities under the night school concept. Soon the idea started working and within a short span of time, 400 such night schools were started in villages where children came along with adult villagers. In order to bridge the divide between urban & rural India, Shri Shyam Ji Gupta motivated some affluent families from Kolkata to visit Fulbani district as part of the Vanyatra. While returning from the journey it was decided that a group may be formed which would bring out the realities and problems of these tribal societies and make the urban people aware of them who are ignorant of this reality. Thus emerged "Friends of Tribals Society" as a response to bridge gap between tribals and urban citizens of India, in Kolkata in 1989. The experience of running schools in tribal areas of Gumla district in Jharkhand and night schools for tribal people in Orissa helped evolving the concept of One Teacher School. Formally, the concept of “One Teacher Schools” was conceived in Gumla (Jharkhand) in June 1986 in a seminar organised to find out the solution to the problem of illiteracy in tribal villages. Models from Jharkhand and Orissa were discussed and seen as a way forward. 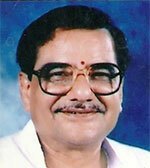 Shri Bhau Rao Devras, a renowned social activist, had outlined the concept of One Teacher School. Dr.RakeshPopli helped in refining the concept and wrote the Book "Khele Kude Nache Gaye" about non-formal method of teaching. The another stream joined in when Late Shri Madan Lal Agrawal, an eminent industrialist who owned coal mines in and around Dhanbad who also participated in the seminar decided to put this idea into practice and set the stage for setting up of first 60 Ekal Vidyalayas (One Teacher Schools) in Dhanbad. This was the first successful experiment of Ekal Vidyalaya model by Late Shri Madan Lal Agrawal. Shyam Ji Gupta This initiative of Ekal Vidyalaya got wings when Shri Shyam Ji Gupta became the Master Architect of Ekal Vidyalaya Model. With his tremendous organisational capacity and unparalleled commitment and conviction for the cause, he translated an informal model of education into a magnanimous global movement which presently became known as Ekal Abhiyan. Since then Shri Shyam Ji Gupta has been the constant source of inspiration and guidance for the entire Ekal Movement. Ekal Movement today stands on the strong foundation built by many leaders and Volunteers at different levels. The contribution of Late Shri Purushottam Das Chitlangia and Shri Rameshwar Lal Kabra is significant. Shri Chitlangia was the all India President of Friends of Tribals Society from 1991 to 2003, when he spent most of his time in constantly travelling to various towns & tribal areas. With his efforts, the enlightened and prosperous citizens of society got associated with Ekal's initiative at various places. Shri Rameshwar Lal Kabra was all India President of the Parishad from 2003 to 2009. His contribution to parishad is highly commendable. His tireless efforts have led to an increase in the chapters from 6 to 28. At present he is the all India Patron of Parishad (FTS). In the year 2000, Bharat Lok Shiksha Parishad is formed to develop chapters in Northern India with head quarter in Delhi. Presently Bharat Lok Shiksh aParishad has 12 chapters in northern India. Shri Subhash Agrawal & Shri Laxmi Narayan Goyal have contributed immensely in the development and growth of Parishad. SHS Samiti is formed to carry forward the mission of promoting cultural heritage through ethics & value education and also to establish mobile cultural centres in the remotest of rural areas. The contribution of the founding Gen. Secretary Shri Bimal Lath in the growth and enhancing the quality has been commendable. Ekal System & standard operating procedures (SOP) were developed by Shri M.L. Jain. This is the backbone of Ekal’s operations. Shri M.L. Jain’s contribution in drafting the working rules of Ekal Chapters (Support Organisation) and SVOs (State Voluntary Organisations) has been a great help in the growth & development of these administrative institutes of Ekal Movement. The contribution of Prof. Manjushree in developing chapters of Friends of Tribals Society & Bharat Lok Shiksha Parishad throughout the country is also commendable. Ekal Sansthan was formed in year 2008 to support Ekal Abhiyan in Research & Development, Communication Strategies, Training & Capacity Building of volunteers, Strategic Interventions, Decision Making Support to Abhiyan Trust & to create avenues in urban areas to bridge the gap between rural & urban communities. In recent time, Arogya Foundation is formed to carry forward the mission of reaching at the remotest village in India to provide better health care services based on the concept of AYUSH and Home Remedies. Also Gramothan Foundation of India is formed to take forward the mission of Integrated Village Development (IVD) by developing Gramothan Resource Centre to work as growth Resource Centre for 100 villages based on the concept of PURA.